Learn about root canal myths and why believing in these myths potentially worsens your oral health as well as your overall health. Several myths about root canals sometimes lead to fear about root canal procedures. Learn about these myths, why they are not true and the risks of letting myths keep you from getting one. You do not have to experience pain to need a root canal. The belief that only individuals suffering from pain need a root canal is a myth. Your dentist knows best when determining the need for a root canal. 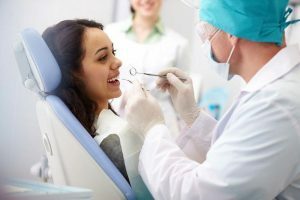 Your dentist uses a variety of diagnostic measures to determine the state of your overall oral health as well as the health of each individual tooth. If your dentist discovers that one or more teeth shows signs of pulp damage or infection, you need to trust your dentist and the decision that you need a root canal. Failing to have the root canal puts you at risk of developing a serious infection or other oral health issues. Do not let this myth keep you from getting a root canal when you need one. Colgate points out that it is not a root canal that causes pain. Instead, it is the decay, infection or other issue leading to the need for a root canal that is the source of an individual’s pain. The actual root canal itself does not cause any pain during the procedure because you receive local anesthesia to keep you from feeling pain during a root canal. The only discomfort is in the fact that for the first few days after the procedure, you may experience sensitivity around the tooth. This myth is not true because whenever possible, saving the natural tooth is the optimal choice. Go forward with the root canal when you need it to avoid possible post-extraction issues. When you have extractions, it potentially changes your appearance, the way you talk, chew and eat. The root canal preserves the tooth and allows for normal eating, drinking and speaking. The fact is that the overwhelming majority of root canals are successful procedures. During the root canal process, the dentist also ensures that all bacteria is removed to reduce need for later issues such as extraction. Root canals do not increase risk of developing any type of oral cancer and does not cause cancer. Colgate Oral Care Center contributor Steve Auger explains that the myth originated by false information presented by a doctor in the 1920s. The doctor claimed that trapped bacteria in the root could leak out and cause multiple diseases, including cancer. The fact is that researchers recently presented documented evidence that some dental procedures actually lower the risk of some cancers. Root canals are safe procedures that help eliminate the cause of pain and infections at the affected tooth. Root canals preserve the natural tooth, avoiding changes that possibly occur after extraction. Make an appointment at All Family Dental Care to ensure your dental health today!